Within the hubbub surrounding the recent National Football League referee strike are some important insights pertinent to the contemporary economic and investment scene. By way of background: the League’s management, comprised of team owners and the NFL Commissioner, attempted to counteract a referee strike by hiring replacements. However, unintended consequences emerged as the season progressed. 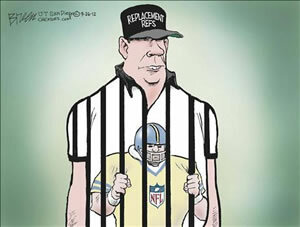 Games were increasingly marked by controversial on-field rulings by the replacement refs. The tipping point was a “blown call” by the refs that determined the outcome of a game involving our home state Green Bay Packers. The Packers’ incident added to a growing chorus of concerns that the integrity of the game was at risk of being damaged by replacement ref rulings. NFL management quickly moved to end the strike as these fears intensified. What has made the NFL so successful is fan interest in the competition between teams on the field. Referees, of course, play an important role enforcing the rules of the game. But they are expected to fulfill their supporting role in the background of the action between the two competing teams. But if ref rulings start determining the outcome of games—and those rulings are controversial—the game runs the risk of being fundamentally changed. 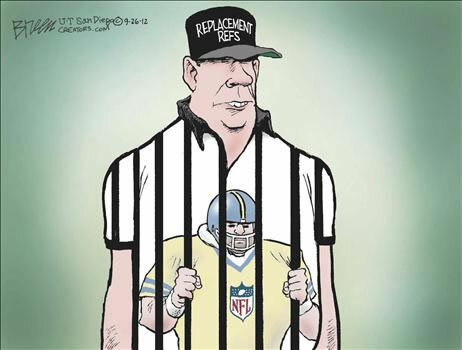 In the extreme, instead of the players and teams on the field being the main event, the play becomes subordinated to whims of the refs, as the cartoon displayed above suggests. The ingredients that make the NFL so popular and vibrant suddenly become subject to erosion. Similarly, the government is an important economic referee enforcing the rules of law within commerce. And, just as the NFL is at its best when the players and teams are the main event, we believe history clearly demonstrates that the economic engine operates best when the government fulfills this task in a supporting role. Government is best “in the background” fostering a relatively stable environment for commerce to unfold. 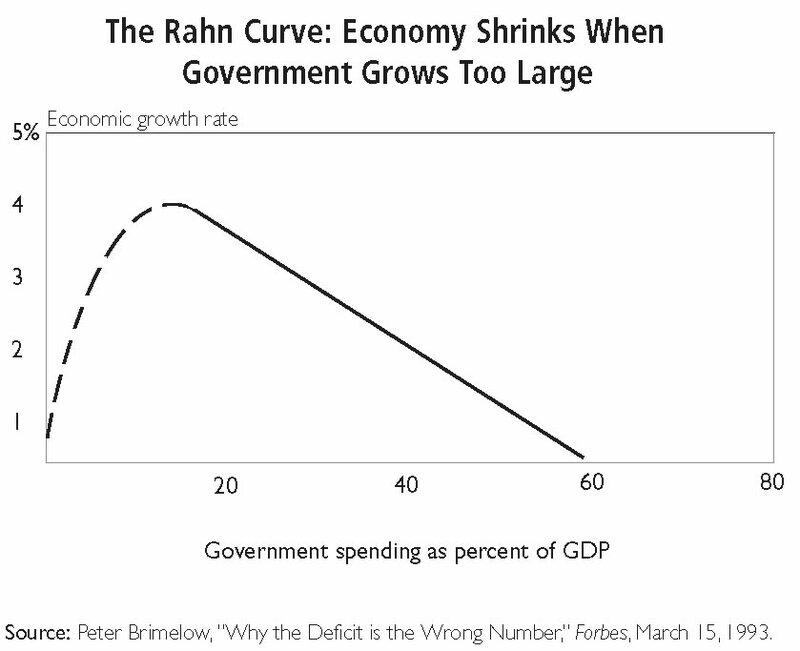 History provides evidence that when a government thrusts itself into the main event through large-scale controversial economic interventions and sweeping rule changes, economic growth wanes. A wet blanket descends on growth as a growing portion of economic resources become allocated by the political process subject to special interest pressure. 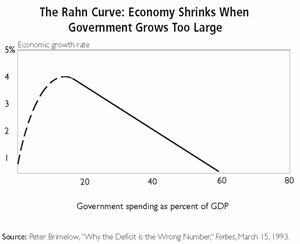 Increased government resource allocation “crowds out” allocation by the much more effective Darwinian competitive process of the markets. Business strategy often (insidiously) shifts from trying to excel within the competitive marketplace, to currying government favor. In the not so far-fetched extreme, “crony capitalism” which plagues the economies of Italy and Greece (to name but two examples) emerges. And the wet blanket effect occurs on a more subtle, largely unappreciated but even more devastating scale. As one economist puts it, “economics is something that happens between people’s ears” . Meaning that the real jet fuel of economic growth and advancement is a dynamic process of millions if not billions of new ideas competing on a trial and error basis to replace existing ideas in the creative/destruction fashion we have described on previous occasions. 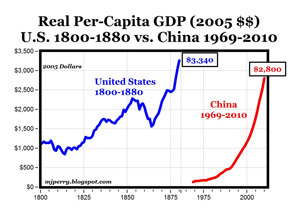 But capitalism—the exceptional economic system where the “between the ears” progress has thrived lifting the living standards of so many—revolves around capitalists, that is, human beings (click the chart to the right for a larger view). But human beings are, of course, psychological creatures. New ideas and the competitive business world already come shrouded with great uncertainty. An aggressive government that threatens to rule the “invisible hand” of private sector minds with a “visible fist” injects still more uncertainty into the process. This uncertainty and fear adds mightily to the wet blanket. Growth may still occur, as sufficient dynamism from the private sector exists. But growth is stunted. Its symptoms are persistently high unemployment, low confidence, lots of money idling on the sidelines, subdued investment into economic undertakings, and much angst about the future. Sound familiar? The upcoming presidential election is being billed as a choice between competing views on the role of government. At this stage, the election looks too close to call. As investors, we must navigate whatever environment the outcome of the election brings. Since it is difficult to unseat an incumbent, the “base case” environment we have assumed is to expect re-election. To this end, the President’s 2012 nomination acceptance speech pledge to engage in “the kind of bold persistent experimentation that Franklin Roosevelt pursued during the only crisis worse than this one” certainly does not suggest the government ref will move back into the background when it comes to the economy. Therefore, our base case assumes the wet blanket will remain plenty wet. ”“We have tried spending money. We are spending more than we have ever spent before and it does not work . . . we have never made good on our promises. I say after eight years of this administration we have just as much unemployment as when we started . . . and enormous debt to boot! ”“Bull markets are born on pessimism, grow on skepticism, mature on optimism, and die on euphoria. With so much fear, uncertainty, and doubt baked into stock prices in the long shadow of the Financial Panic of 2008, corporate earnings growth has exceeded general expectations. A backdrop of favorable surprises even from a low base has triggered rising stock prices. And the good news appears to be that irrespective of who wins the upcoming election, stocks still remain priced with very glum expectations for the future baked in (click the chart to the right for a larger view). If the phases of Templeton’s bull market chronology are close to describing the psychology of markets, the stock market only remains in the early phases of pessimism/skepticism. The past few years, the economic expansion has also demonstrated an ability to grind forward in a football “four yards and a cloud of dust” fashion. There has been sufficient dynamism to fuel the advance despite loads of fear, uncertainty, and doubt. We expect this to also be the case if the wet blanket continues. 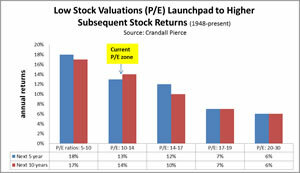 The pockets of dynamism represent investment opportunity in a growth starved environment. What are the sources of the dynamism and how durable are they? Today’s ability to communicate, disseminate, and collaborate on ideas is nothing short of astounding. The jet fuel for new idea generation has never been greater. More minds than ever before now have the ability to participate in sharing and shaping of knowledge as the tools of technology have moved into the reach of people across the world. 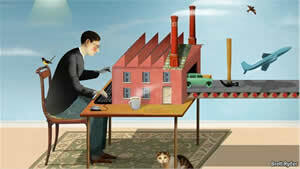 One of the hot beds of application of the new ideas lies in manufacturing. Despite endless headlines to the contrary, manufacturing remains big business. Armed with new technologies that significantly enhance productivity, a manufacturing renaissance in this country is underway. In an even larger sense, some see so much potential in this productivity trend that they believe another Industrial Revolution is underway. This leg is based upon “computational manufacturing”. Investments we have in companies at the forefront of these trends: simulation software, 3 D printing, direct digital manufacturing sophisticated measurement tools and services, have been gathering investment momentum, and their promise remains substantial in our estimation. And technology as a productivity enhancer has applications well beyond manufacturing. With competition, markets, and companies transcending country borders, the drive for increased productivity growth is unrelenting. Businesses may be tentative due to wet blanket reasons about hiring or undertaking large physical expansions. But, if they can outpace the competition by investing in productivity enhancement tools, it’s a different story. The ability to store and “mine” big data, tools that enable the communication trend, and emerging payment systems also represent fertile investment ground. We have numerous investments in productivity “enhancers” in these areas as well. In addition, consumer spending patterns reflect some discernible trends. The wet blanket has increased consumer thriftiness and retailers that cater to this trend are garnering market share and profits. Another trend relates to the “mass customization” of products and services. Whether it is coffee blended to one’s particular tastes or affordable designer goods made available at “value” prices, growth and market share gains await those businesses that deliver across the domestic and global settings. Today’s fiscal problems, the conditions creating the wet blanket, trouble in the Middle East, growing Japanese and Chinese tensions, are all big, scary problems. But from an investment perspective, today’s problems must be considered in the context of history. The tables below provide a look back to other periods of significant economic trouble. Note how well a blended portfolio of stocks and bonds served investors. No doubt the significant troubles and economic calamities of those earlier periods also appeared insurmountable. Yet somehow, despite the “intractable” problems of those earlier times which arguably were just as great or greater than those we face today, the economy and the stock market overcame these crises of confidence periods. We expect the same this time as well. Like today, bonds in the 1950s came into the decade priced with overly gloomy economic expectations. Bonds of all types proceeded to saddle investors with a “lost decade” on their bond investments. 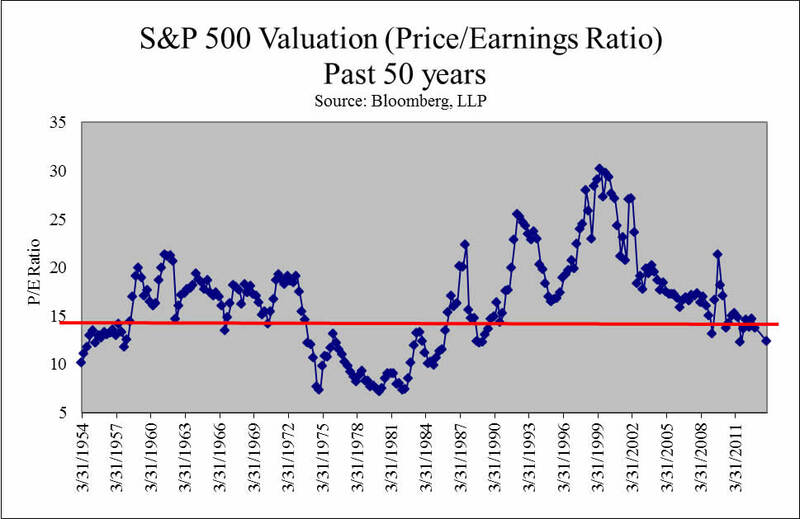 Also like today, stocks came into the 1950s priced for a glum reality. 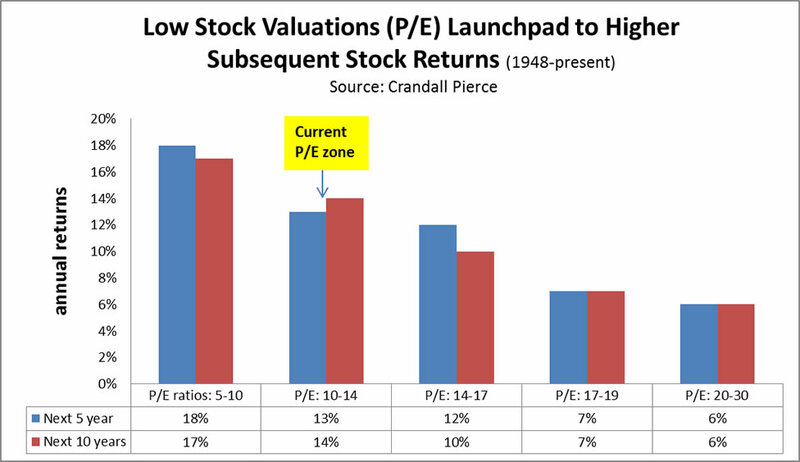 When that proved overly pessimistic, stocks registered very rewarding returns. 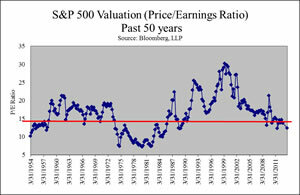 Today’s pessimistic expectations and subpar stock valuations have the bar set very low for stock investors. Just think what could occur if the wet blanket were to be lifted. Investing in growth in a growth stunted world. That is our strategy. 1 McCloskey, D. (2010). Bourgeois Dignity, Why Economics Can’t Explain the Modern World. University of Chicago Press. 2 Folsom, B. (2008). New Deal or Raw Deal. Simon & Schuster. 3 Zweig, J. (2011. January 22). Will small investors ever warm up to stocks again? Wall Street Journal.